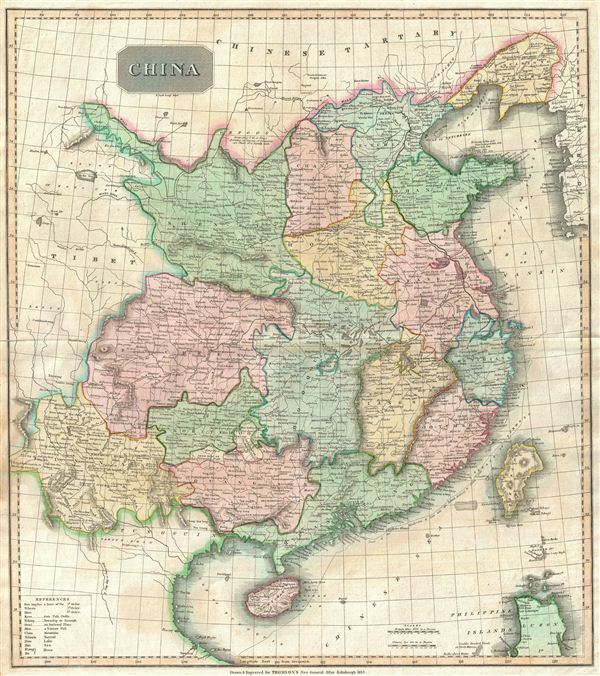 This fascinating hand colored 1815 map depicts China with its provinces color-coded by hand. Interestingly, the map shows the course of the British 'Macartney Embassy' or 'Mission' of 1793. Escorted by the Royal Navy gunship H.M.S. Hindoostan, the H.M.S. Lion transported Lord George Macartney to China for a meeting with Emperor Qianlong. Macartney attempted, unsuccessfully, to ease trade restrictions between the two nations. Maccartney's failure was largely based on incompatibilities between the European and Chinese world views. The Qianlong Emperor operated on the assumption that all nations were in fact tributary to China whether they knew it or not and returned a letter to King George III commanding him to 'Tremblingly obey and show no negligence!' The episode aroused the imagination of the British public and generated interested in the lucrative China trade in general. Taiwan or Formosa Island, appearing in the lower right quadrant, is woefully misshapen. The whole is beautifully engraved in the minimalist English style pioneered in the early part of the 19th century. Relief is shown by hachure with towns, cities, and major topographical features identified. Thomson maps are known for their stunning color, awe inspiring size, and magnificent detail. Thomson's work, including this map, represents some of the finest cartographic art of the 19th century. This beautiful map was engraved in 1815 by R. Scott, Edinburgh, for inclusion as plate 33 in Thomson's New General Atlas Edinburgh, 1817. Rumsey 1007.042. Phillips (Atlases) 731. Newberry Library: Ayer 135 T4 1817.